Yes, I can’t imagine why it hadn’t occurred to me to clean it out sooner. It is done now and because I posted the photos I have a better idea to help utilise it more, thanks to Deb J.
I don’t know why, but I love anything to do with paper, pens, notepads, etc. I could happily LIVE in an office supply store. So it’s probably a good thing I don’t have one of these, even though I’m also a little envious, like Willow! It would be a magnet for supplies. I have always been a paper lover too, ever since I worked in a stationary/newspaper shop when I was a teenager. My godmother will tell you I don’t right nearly enough letters anymore though. I’ll just have to use your inspiration to keep it tidy! I bet the writing desk you are getting will be lovely. 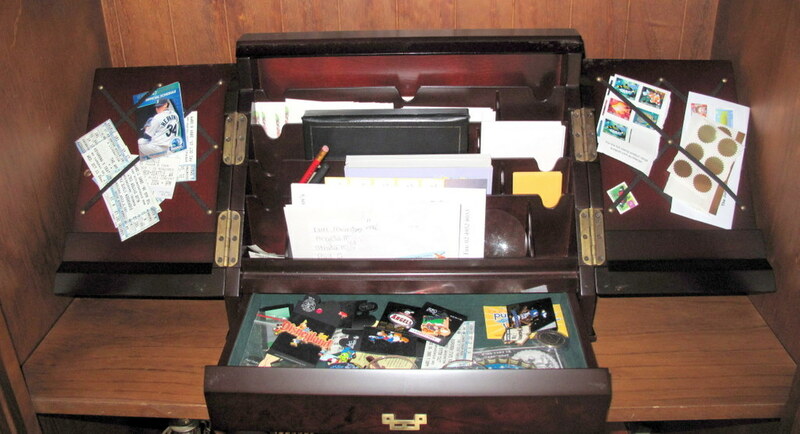 I always loved old writing desks especially the ones with lots of drawers and hiding places. Great improvement. I wish I had one of these. It would come in handy for all the note cards I send to people. Now that you mention it I could probably transfer the birthday cards to it and do away with the card file I have. All the birthdays are in google calendar so I don’t need both. Good thinking, thanks. Colleen, I love your little writing desk, especially after it was decluttered. What a beautiful piece! I’m like you and Jo when it comes to paper/office products. I have a handmade little floor cabinet with three small shelves and a little door painted with sunflowers and bird houses just for my stationery and greeting cards. I keep track of birthdays and other special events on my Google birthday calendar which sends me a reminder three days before the event. I don’t know how I managed before Google calendar. It keeps me organized with so many things. your little cabinet sounds lovely and would be a splash of spring on a winters day as well. I am glad you have discovered the value of an on-line calendar I find mine very useful especially those reminders about birthdays. I set mine up a week in advance because the postal service is so slow ~ snail mail for sure. Have you tried using it to set up a menu plan? Not yet, but today I set up an exercise plan! 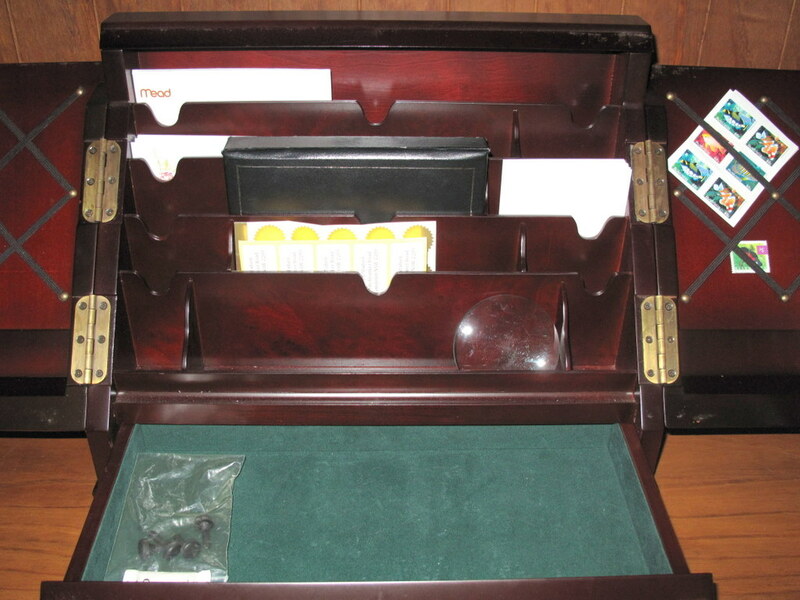 I love to declutte a small drawer or cabinet. Looking inside gives me such a feeling of peace and clarity, especially if the room tha that houses it is not as tidy as I’d like! welcome to 365lessthings and thank you for leaving a comment. When I do a clear out like that I tend to keep going back to have a look at my hand work it is very satisfying. It does sound like you are using the small task to justify your procrastination to avoid the big task though. The best thing to do here is to break the large task down to small tasks and do a little at a time. I always say never look at the big picture or it can scare you off beginning the task at all. Bive it a go break it down and see how that works for you. Oh, never fear, I also love to do a wholesale purge!